Surfboard fins are a crucial part of your surfboard setup. Choosing fins that will work best for you and your surfboard depends on your size, riding style, and your surfboard's fin box. Before talking about fin size or different fin configurations, it is important to distinguish between glassed-in and swappable fins. Glassed-in fins are laminated into the surfboard. 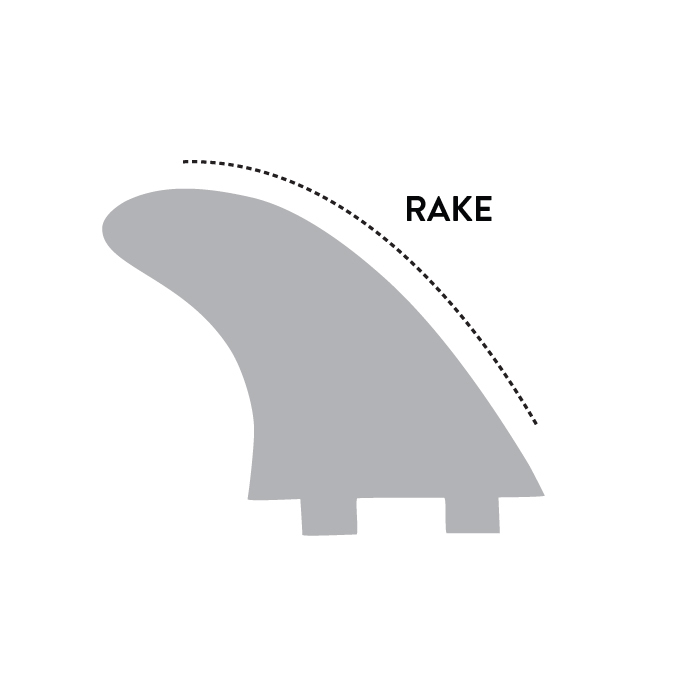 As you might imagine, a glassed-in fin might be smoother and sounder than a removable fin. However, glassed-in fins are difficult to repair and do not offer you the versatility of removable fins. Surfboards with removable fins have “boxes” that fins are screwed into. Removable fins can be added or removed using a fin key and adjusting the small (typically stainless steel) inset screws. Don’t force your fins into the box as that may damage your board or the fin; instead, make sure the screws are loose enough and that your fin is facing in the right direction. Center and outside fins have different shapes, so make sure you are using the right fin for the right box. Once your fins are in place, tighten your screws with the key, making sure the fins are secure but not TOO tight. The other major player in fin boxes, Futures Fins, connect to your board using a Truss Base along the entire length of the fin box (unlike plugs) for a strong, lightweight connection. Quick and easy set screws hold the fins in place. Single Tab (Futures) and Dual Tab (FCS) style fins are not cross compatible. You must use fins that are compatible with the fin boxes installed on your surfboard. When choosing fins for your surfboard, you should start with your weight. 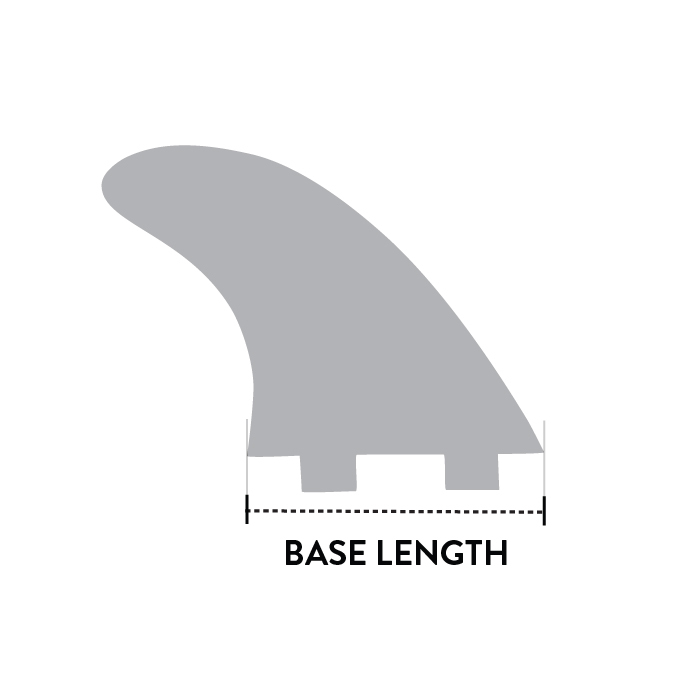 Choosing the appropriate fin size is the first essential step to choosing the right fins. Once you have decided on a size, examine your board's fin configuration, or fin setup. Your board will be outfitted with 1 to 5 fin boxes. 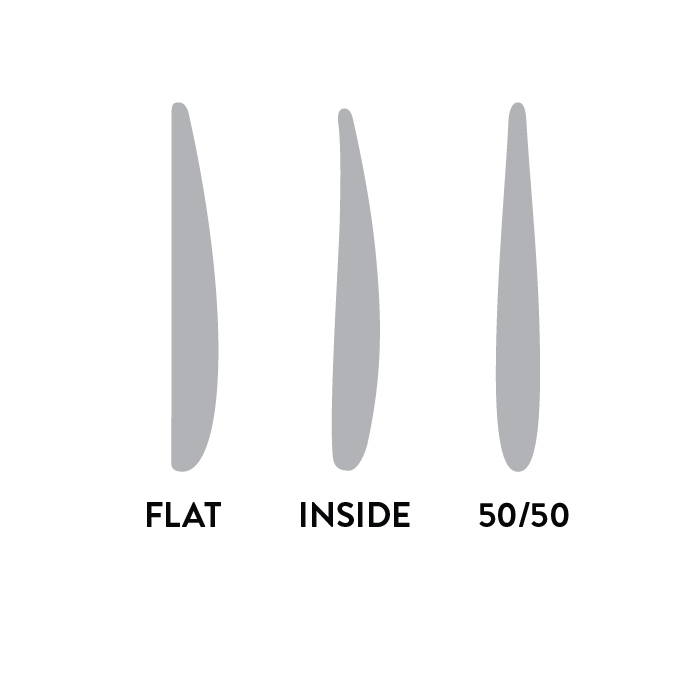 The following chart is evo’s recommended fin size according to rider weight. If you are in between sizes, consider the type of board or type of waves you will be riding with that particular setup. For example, if you are in between size M and L, you might pick size M fins for your small wave board, but size L fins for your big wave board. 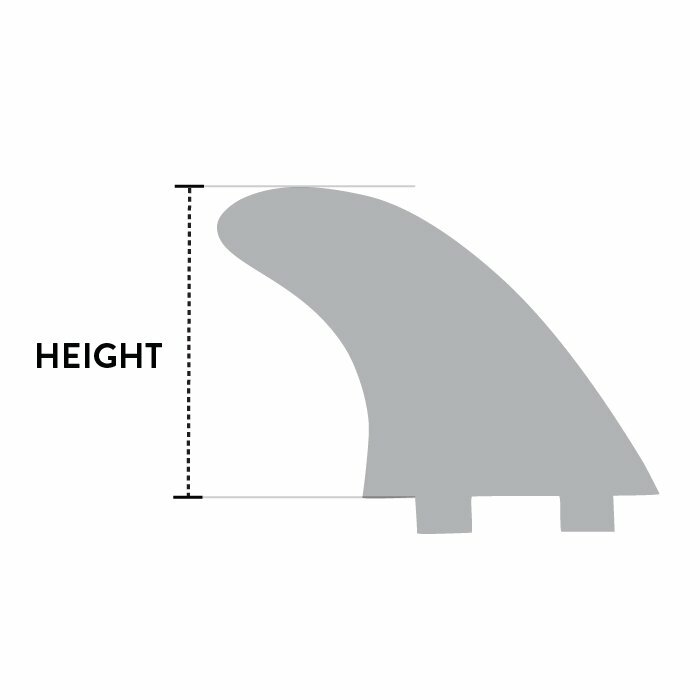 Once you’ve decided on your fin size, you need to understand your board's fin configuration. To determine your fin configuration, examine the base of your surfboard near the tail. The number of fin boxes you see is the fin configuration and will likely range from 1-5. The most common surfboard fin setups are Single, Twin, Thruster and Quad. Some boards are equipped with 5 Fin boxes so you can mix and match more easily, while more and more boards are now fitted with a longboard single fin box and regular side fin boxes called 2+1. A single fin box is most common on longboards and is the most traditional surfboard fin configuration. Turning with a single fin is limited, meaning single fins are ideal for fast, straight shot surfing. Single fins will provide stability, control, and predictability to your longboard. Longboard single fin boxes are long and allow you to move the fin forward for a looser feel, or further back for more control. Twin fins or a dual fin configuration will make your surfboard fun, playful, and maneuverable. Two fin setups are not ideal for big-wave riding and are commonly featured on shortboards to enhance their speed. Twin fins offer a skatier feel and longer, more drawn out turns. 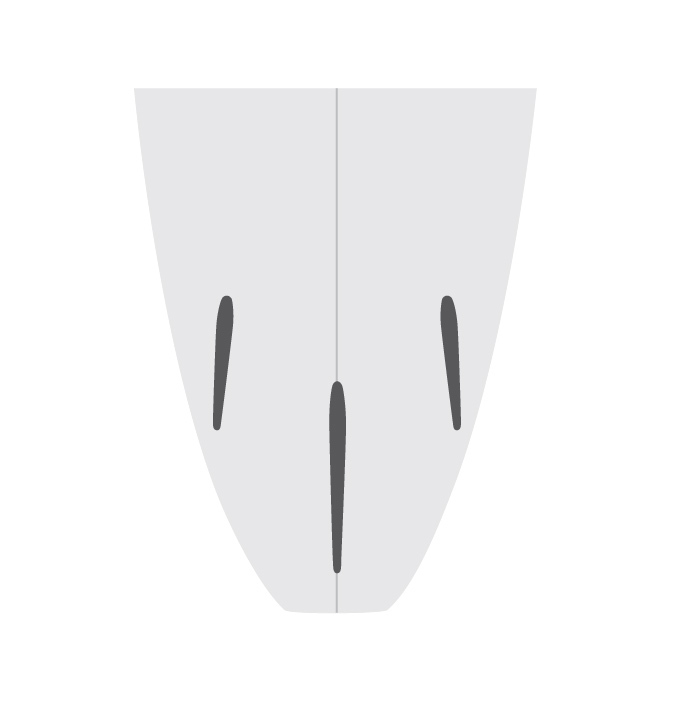 Nowadays, 3 fins is the most common configuration and can be found on a variety of surfboard shapes and sizes. The two outer fins are closer to the middle of the board, angled towards the board center (“toed-in”) and can be flat on the inside in order to increase water tracking and speed. The center fin is the closest to the tail and is symmetric on both sides for stability (see Foil for more info). Tri-fins perform well because they add stability, control, and maneuverability that beginners to pros excel on. A thruster configuration also gives you options – ride twin or single if you want! 2+1 configurations have a longboard single fin box in the middle, with 2 regular thruster side fin boxes to each side. The middle box is longer, allowing you to set your middle fin forward or back. This is an increasingly popular fin box configuration on eggs, funboards, SUPs and logs. The Sweep, Toe, Base Length, Foil, Flex, Height, and Cant are important measurements of every surfboard fin, and should be considered when choosing your next surf fins. 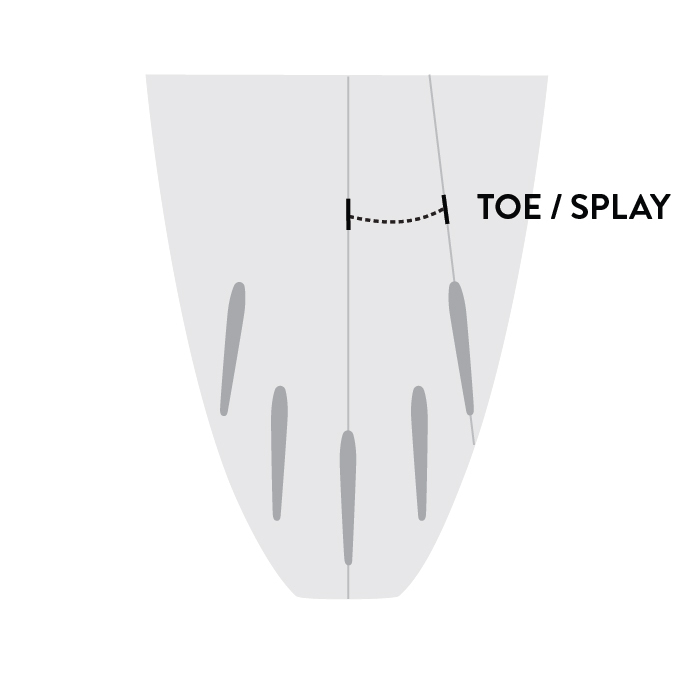 The toe or splay of a surf fin is defined as the angle of the side fins in relation to the board’s central stringer. Side fins are typically referred to as “toed-in,” with the front of the fin angled towards the middle of the board. This causes water to pressure the outside of the fins, for increased responsiveness. The base length of the fin is the widest point of the fin, and sits flush with the board once installed. This length can affect how the board will respond to turns. Longer fin bases create trajectories for water to go past – so your surfboard will move faster. 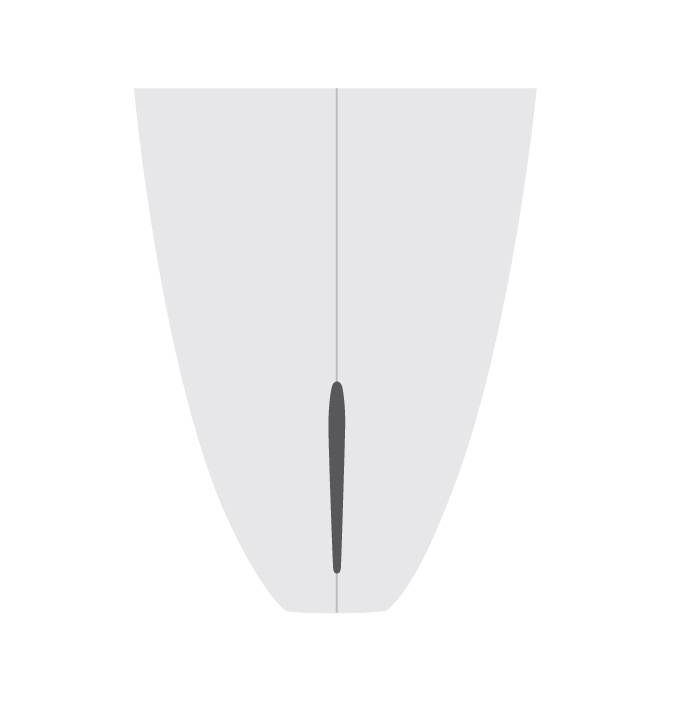 If you want to make sharp turns, however, go for a shorter fin base length. 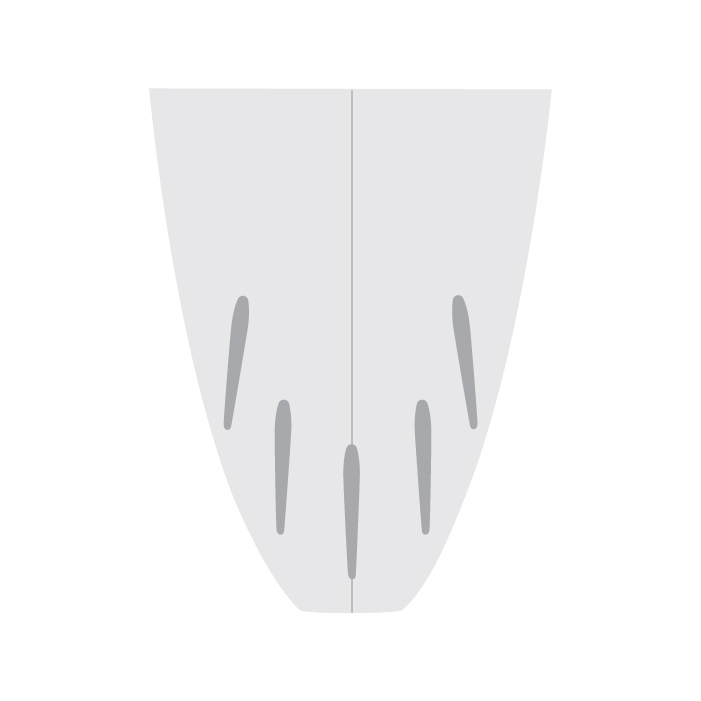 Foil refers to the shape of the outside and inside faces of your fin, thinnest near the tip and thicker near the base. Foil alters the flow of water over the fin surface and has a direct impact on the performance of your fins and board. 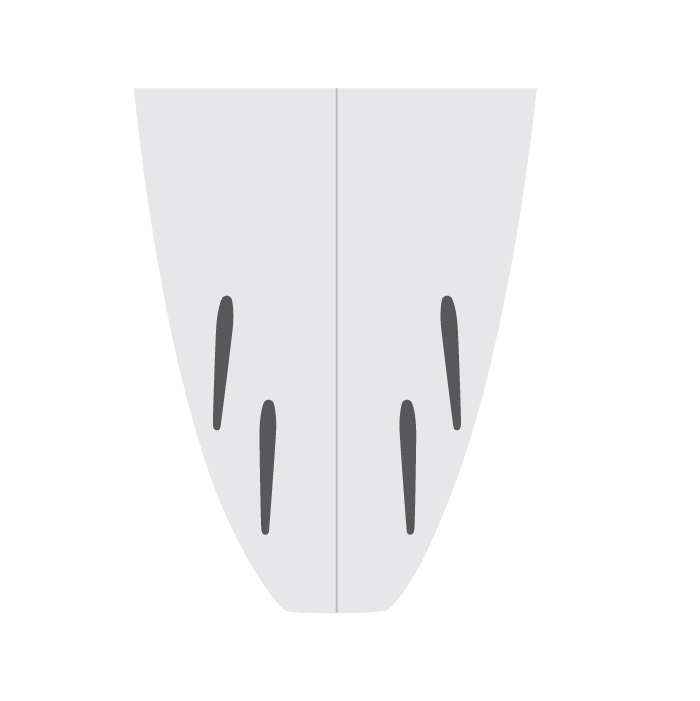 Middle fins are always symmetrical and convex on both sides (sometimes called 50/50) for even distribution and stability, while outside fins are usually convex on the outside face and flat or curved on the inside. A flat inside face creates a solid balance of control, speed, and playfulness, while a curved or concave inside face maximizes lift with minimal drag, ideal for speed generation and fluidity. The flexibility of a fin, or lack thereof, can significantly affect the way a surfboard rides. In general, a flexier fin will provide a skatier feel on more playful waves, but a stiff fin is ideal in faster more hollow waves. 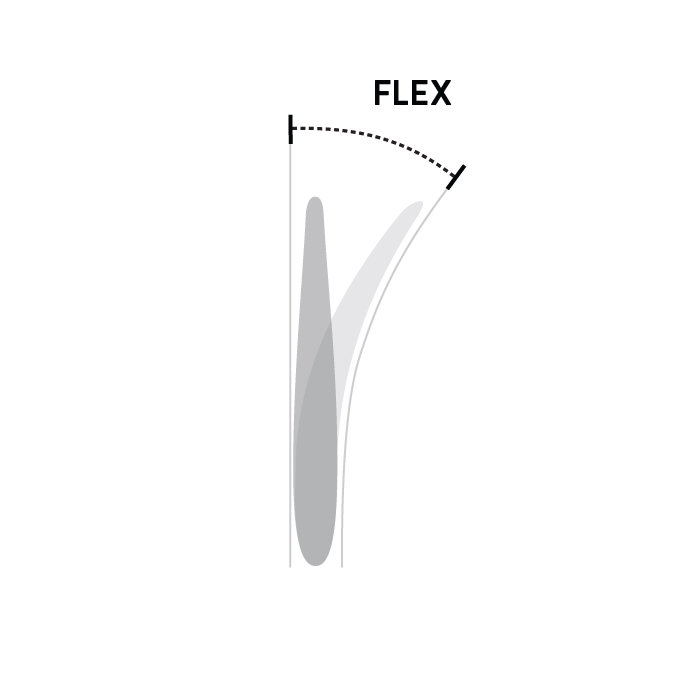 It is important to note that high end fins can be both soft and stiff – they have flex patterns. Many fins now have a stiffer base for tracking and stability, with a softer tip that make it easier to break your board loose while turning. As a rule of thumb, stiffer fins work well for all ability levels; they are forgiving, stable and predictable, creating a solid platform for progression and big wave riding alike. Soft and flexible fins are great for making fast, sharp turns and will give freesurfers a lively feel to their board, but are more difficult to control compared to stiff fins. The height (often referred to as the depth) is measured from the base of the fin to the tallest point of the fin. This measurement can change your board’s stability and ‘grip’ through turns. For surfers who desire a board that is easy to control, a taller fin will be more forgiving and handle turns in a relaxing manner. Shorter fins do not grip the water as well, but rather allow the board to be more “buttery” when turning, ideal for spin-like maneuverers on the water, for example. 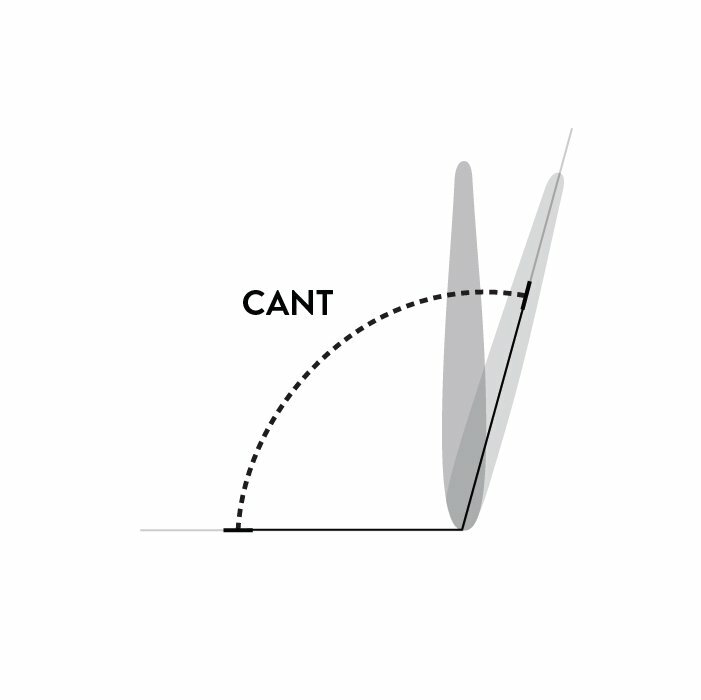 Cant is the tilt of the fin in degrees, in relation to the base of your surfboard. 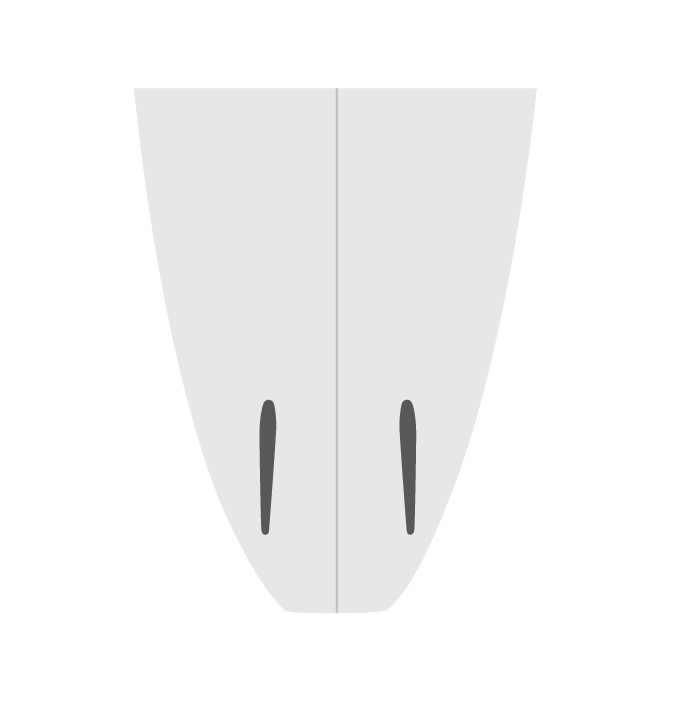 For example, a fin that is straight up down and in the fin box has no cant (90°) and will likely make your ride faster, while anything more than 90° will increase responsiveness. In order to enhance rider-to-board connectivity and responsiveness, especially through turns, you will benefit from canted fins. The less cant a fin has the more drive and acceleration your board will have but will also be less playful. In turn, the more cant a fin has the looser and more maneuverable your surfboard will feel. So what kind of fin is best for you? The best way know what fin is best for you and the waves you surf is to try different sets. Just like test driving a car, you should test drive fins in a variety of configurations and types. Stiff surfboards paired with small, flexible fins with a little sweep will add playfulness. The cluster or placement of the fin refers to how spread out or how close together the fins will be when attached to your surfboard. Fin location in relation to the tail will affect your board's feel. Set forward creates a looser feel. Set further back provides more hold and control.